How is pricing for storefront signs calculated? The simple answer is that it depends on the style you choose. A simple sign printed on aluminum can be very inexpensive and affordable! With installation, a 4’ by 8’ aluminum sign can be about $500. However, if your landlord requires a lighted channel letter sign or another more technologically-advanced type of signage that requires professional installation, you may be spending upwards of $8,000. 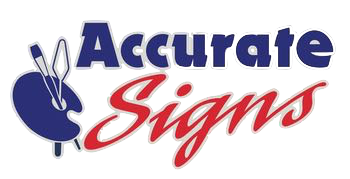 At Accurate Signs, we no longer build lighted signs, but we will gladly recommend another good company to you based on your needs. What are the most popular signage options for business events? The most commonly-used signs for events are pop-up banners, as they’re easy to transport and set up! They’re also inexpensive, with a full-sized pop-up banner costing you less than $200, even with tax included. How long does it take to create and install a storefront sign? If you want a simple, aluminum sign, and you plan to self-install, you can have the finished sign in your hand within a few days! If you want a more complex sign, or if you want us to install the sign for you, it could take a few weeks (including time to get a sign permit from the city). Does Accurate Signs provide graphic design help? How long do car wraps usually last? How often should I expect to replace my car wrap? Depending on what you have done, a wrap will be effective for five to eight years! As sunlight can cause premature fading, park your vehicle out of the sun for a longer-lasting wrap. The simple answer is that it depends on the style you choose. A simple sign printed on aluminum can be very inexpensive and affordable! With installation, a 4’ by 8’ aluminum sign can be about $500. However, if your landlord requires a lighted channel letter sign or another more technologically-advanced type of signage that requires professional installation, you may be spending upwards of $8,000. At Accurate Signs, we no longer build lighted signs, but we will gladly recommend another good company to you based on your needs. Are there options for financing or payment plans? Unfortunately no, we currently don’t have any options for financing. Are there any package options for Accurate Signs products? Yes — we will gladly work with customers on a case by case basis for any package pricing. Does Accurate Signs provide setup/takedown services for large promotional signage? If you’re just looking for lettering and installation on driver and passenger doors, your vehicle advertising can be as inexpensive as $125. On the other end of the spectrum, if you’re looking for an in-depth wrap for a large vehicle, you can be looking at $4,000 or more. We recommend a partial wrap, which can cost between $1,200 and $2,000. Car wraps generally last between five and eight years and will retain their brightness and last longer if you keep your car parked out of harsh sunlight. How to remove car decals? If you haven’t had your car decal for long, it should be fairly easy to remove. If you have an older vinyl wrap, you may end up needing vinyl razors, Rapid Remover, a cleaning agent (such as 91% alcohol), and patience! It all comes down to how complex you want your sign to be. If you’re looking for a simple aluminum-printed sign, it can be very inexpensive ($500)! However, if you are looking for a multidimensional sign that requires professional installation and for us to get a city sign permit for you, you can end up paying $8,000 or more.